Dr. Arun Kumar graduated with a Ph.D. in Biotechnology from Punjab University, Chandigarh and CSIR-IHBT, Palampur, H.P. India in 2013. Thereafter, he joined Prof. AC Kushalappa’s group as postdoctoral fellow at Department of Plant Science, McGill University, Canada from 2013-2015. Later on, he moved to USA to join Prof. Shelley Jansky and Dr. Dennis Halterman’s group at Department of Horticulture, University of Wisconsin-Madison, USA from 2015-2017. 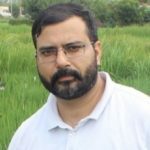 Recently, Arun was awarded with prestigious Ramanujan Fellowship in 2017, and has joined School of Agricultural Biotechnology, Punjab Agricultural University, Ludhiana, Punjab, INDIA. His research interests and long term goals are to understand the mechanisms of genetic resistance in crops against bacterial and fungal pathogens at the molecular and biochemical levels and exploit this information for crop improvement. Understanding Rice- R. solani interaction mechanisms to identify major determinants of pathogen virulence. Identification of sheath blight resistance/susceptible genes in rice based on –OMICS approaches. Engineer susceptible elite cultivars for enhanced ShB resistance using genome editing tools like CRISPR/Cas9.